Our house and pool were built in 2000. There were several owners and a foreclosure in between before we bought it in 2012. The backyard only had 2 shrubs so my first project in 2013 was to completely redo the yard by exposing all of the irrigation lines, fixing irrigation leaks, and installing 3 fruit trees, 2 shade trees, 1 decorative patio tree, and several dozen shrubs. I was using the pool service that we had at the previous house that we rented because I thought he did a good job and he is a really nice guy. However, we decided we needed to cut costs and as of 2 months ago I am now taking care of the pool myself, with limited help from my kids [emoji1]. I found Leslie's Pool Supply staff to be generally helpful but their prices are so ridiculous that I try not to use them, other than for advice and water testing. I think I am at the point where I understand how everything works and I can do almost all of the maintenance and repairs myself. 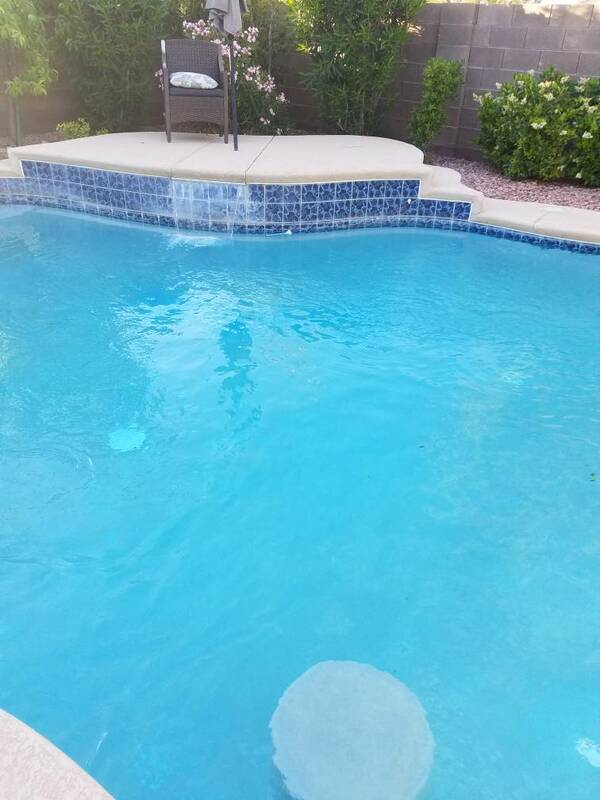 Plus, I am finding that like most things in life, nobody cares about my stuff as much as I do so I'm giving the pool and equipment a lot more TLC than the pool guy did. The pool was built by the now defunct Paddock. It is 12,240 gallons, Paramount PCC2000 in floor cleaning system with a deck debris canister and a dedicated Pentair Whisperflo WFE-4 pump running it, Pentair Whisperflo WFE-6 pump running the filter and waterfall feature, Pentair Clean and Clear 420 cartridge filter, Jandy Energy Filter on the waterfall plumbing, Pentair Mastertemp 400 natural gas heater that we bought and had installed 3 years ago, and a significant amount of cool-deck all around. Also, as of 3 weeks ago, I now have the Skim-A-Round All-in-One skimmer basket. Since taking over my own pool maintenance I have replaced the gaskets and o-rings on the WFE-4 pump, cleaned the cartridge filters and found that in that process I needed a new filter clamp, cleaned the energy filter and replaced the o-ring, replaced the leaking drain plug and o-ring on the heater, fixed one of the in-floor pop up heads that was blocked by an Acacia seed pod from the adjacent park, and then fixed that head again after it was plugged by a tiny pebble (in Vegas, our ground cover is almost always rockscape). Welcome to the forum. If you truly want to manage your water yourself, please consider one of our "drop based" test kits in Pool School. Welcome to TFP! Yeah, my friends back home there have been posting about the crazy weather changes. No worries, summer and 115 degrees will be there soon enough. :sun: Great to have you with us. PS ~ I love my TF-100 test kit. Won't go near pool water without it now. Also consider the magnetic speedstir for perfect mixing. Have a great day. Thank you. Can you please clarify where I find the thread for Pool School? Pool School - Pool School There ya' go! Test Kits is under the chemistry section. Thank you for the Pool School link. The link doesn't show up on the mobile version of the website or on the TapTalk app. The link doesn't show up on the mobile version of the website or on the TapTalk app. The link is also below in my signature. Can you get to it form there?